Whilst the Swedish Games industry is hailed as an innovative, money churning sector the world over, little is known about some of the individuals currently plying their trade in other regions of the world. I have previously profiled Friend & Foe based in Japan, however sticking in the land of the setting sun, this profile centers on 22 year old Dennis Bagstevold. 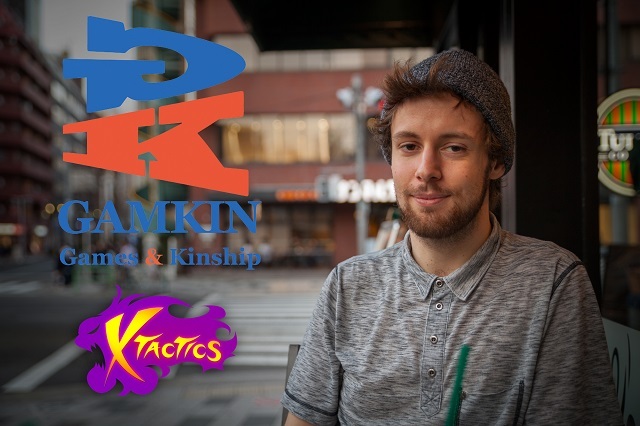 Previously the Project Manager for Swedish Game Awards, Dennis made the move to Tokyo as part of a 6 month internship at Japanese game company – GAMKIN, Inc. His ability to speak Japanese maybe be limited, but his passion for the industry shines through. This is his profile! So one year ago I had a university course at Södertörns University (as a part of the Games Program) that was about self marketing with the goal of getting an internship and/or job in the games industry. I went all in with this course and created a website for myself, and a highlight reel of the projects I had worked on before I started to contact companies a year before my planned internship. One thing that we got told a lot was that it’s important to niche oneself to separate yourself from the crowd, so I did that by trying to find a company in Japan (a country which I’ve wanted to work in for a long time) which I could do my internship at. So I pulled every string available to find a way to contact these companies which usually only have a Japanese phone number and a fax number. Eventually I found myself to the Kyoto Bitsummit website where I contacted all the companies in English and bad Japanese. GAMKIN, Inc then reached out to me and accepted my internship. Do different companies have different names for roles and GAMKIN is no exception. The name of my role is “Game Creator” which basically means that I do everything that is necessary to do outside of the actual programming. This includes, community management, creating marketing content (like this video: https://youtu.be/6Sry5euPf8E), writing (for dialogues and story), level design, quality assurance and game design (mechanics of the game). Right now GAMKIN is focusing mainly on X-Tactics which is a turn-based RPG (with quicktime sequences). I like to elevator pitch it as; You have the Persona type characters in the strategic environment of X-Com, but instead the frustrating percentage calculation of hit or miss, you instead have a quick-time event that plays like Osu! And that’s just explaining the main combat, there are lot of other functions except this like the weather and GPS integration for example. The real weather affects the battlefield in the game, and monsters can be seen and found close to your current location. The game really has a mechanical depth that I haven’t seen in any mobile games in the west. Talk Together, Create Together, Play Together, Learn Together. What are some differences between the Swedish Games Industry and the Japanese? Well something that is really noticeable is how mobile really is the primary platform for games here in Asia unlike Europe and America who still focus a lot on PC and Console. The games that are being created here, although having a narrow variety in graphical styles, have a very wide variety when it comes to mechanics. This unlike the western mobile games which in my opinion are often very simple both in style and mechanics and cater mostly for a casual audience. If I heard about X-Tactics without knowing the platform, I would have never guess it would be on mobile. With that in mind I actually got really surprised of how well it actually runs and works on mobile. Of course X-Tactics isn’t the only example of this as I’ve seen full 3D games for phones with storytelling campaigns and real-time co-op for example. What’s your tip for getting into the Japanese games industry? Well while I consider myself very lucky in finding a very open and progressive company like GAMKIN, Inc, I’d recommend anyone to learn Japanese before coming here. To give a clear goal I would suggest trying to pass the JLPT 2 or 1. When you passed these tests you can put them on your CV and become a huge asset to a Japanese company by knowing an extra (or two) languages than other colleagues at a company. After that I would suggest contacting companies before going. To work in Japan you need a special working Visa that can only be issued by Japanese companies (otherwise working here is illegal). This can be an annoying process for the company and finding a company who is willing to do that can help a lot when it comes to security. Some people go here without this in mind and try to contact companies on a tourist Visa which in my opinion is just a waste of time. So try to get everything together before actually venturing to the country of the rising sun. Haha! Not right now, maybe if you ask me again in the summer when the 35 Celsius murders me. That heat will make any swede miss their home country. I really recommend anyone reading this to try out X-Tactics since it could give you a bit of an insight of how a game made by both western and Japanese people can look like. If anyone wants some more recommendations on games to get to know the Japanese game developer minds you can feel free to contact me as well!